The Partnership Level is about love, language and respect. 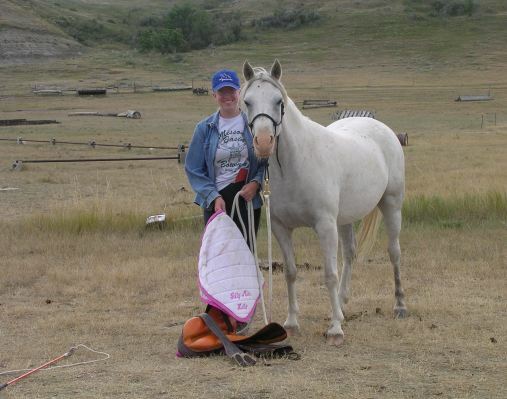 Learn to play The Seven Games, break down the prey-predator barrier, create a language with which to communicate with your horse, and teach your horse on the ground the things you want him to understand when you are on his back. Learn natural riding dynamics by riding with one rein, with focus, and with the Carrot Stick. They're the first building blocks for a great independent seat. Impulsion, Positive Reflexes, harmony. Develop more feel, better timing, and more harmony with your horse. This level branches into the Four Savvys - On Line, Liberty, FreeStyle and Finesse - taking horsemanship into realms far beyond what people do with horses every day. It brings your horse into harmony with you. He becomes increasingly softer and more willing with "Positive Reflexes." This level also explores impulsion, which is why you'll feel less and less need to use the reins for control. Instead, they become a valuable tool for more subtle communication. Respect, impulsion and flexion come together. Communication with your horse becomes so subtle, it's almost invisible. This level explores the development of Vertical Flexion for increased power through engagement of the hindquarters. You'll learn how to do everything with more accuracy and finesse, in all Four Savvys, taking each one to a whole new level. Horsemanship, different horses, difficult horses, performance. Each of these areas is in itself a deep subject. It involves greater study time and personal tuition with top instructors. This level is for those with professional goals, or for the extremely focused individual pursuing higher horsemanship goals. Expand your relationship with one special horse, taking him to even greater heights, while continuing to develop greater expertise within the categories defined by the Versatility Level. While you will still be guided along the pathway, these levels are more about time, experience, and allowing the horse to teach you. It's what you learn after you know it all that counts. You'll have developed true unity with more than one horse, and this is where natural horsemanship begins to take on an art form. True Unity with horses is what compels the most dedicated of horsemen. Mental, emotional and physical unity with a horse is something very special. It's not the result so much as who you have to become in order to achieve it. Level 10 is a lifetime study. There is no one to judge you but the horse himself.